I have yet another fabulous blogger to introduce to you all. I would honestly like to shadow her for a day. Her life is similar yet so different from mine, and I want to join her for a little while. Just read our little q&a for more deets on this lovely lady. Firstly - let's start out with your lovely blog. What inspired you to begin your blog? I was inspired to start my blog because of multiple things. I am planning on thru-hiking the Appalachian Trail in 2016 and knew that I wanted to document my hike when I was actually hiking. I figured a great way to get into the habit of documenting what was happening then was to start documenting what is happening now. At the same time a friend of mine was also starting a blog so I said "why not?" I might as well have some support and see where this writing thing goes. The name of your blog is Blue Giraffes and Concrete Jungles. Why did you choose that name? Blue Giraffes and Concrete Jungles was semi- inspired by my friend as well. While brainstorming for blog names for each other she told me she had read an article about blog names and that picking two opposite things and combining them was a great place to start. Blue is my favorite color, giraffes are my favorite animals and I currently live in NYC (i.e the concrete jungle) and boom the name was created. Could you share a little of what your daily life is like with my lovely readers? My daily life can be quite hectic. I work as a house manager for a family in NYC. I'm their nanny, chef, personal assistant, any and everything they need. I start my day early and end it late. Sometimes it's an easier day where I'm just carting kids to and fro, others I'm out of my mind pulling my hair out running around like a crazy person. I love it most days. You have some totally awesome recipes on your blog. What ones are your favorites? Thanks! Part of my job is making dinner every night which has created a great way for me to learn and try new things, all of which I love sharing with my readers. I love making and eating pasta bolognese, hummus and kale tabbouleh, and pulled pork with homemade barbaque sauce and coleslaw. yum, yum, yum! When I'm not blogging, I love to read. I spend an equal amount of time exploring the wonderful New York City and just sitting on my couch and catching up on the latest TV episodes. I've recently discovered the joy of decorating and now in the midst of trying my hand at putting together a living room. Updates to come! Share some of your favorite posts with us and tell us why they're your fav. 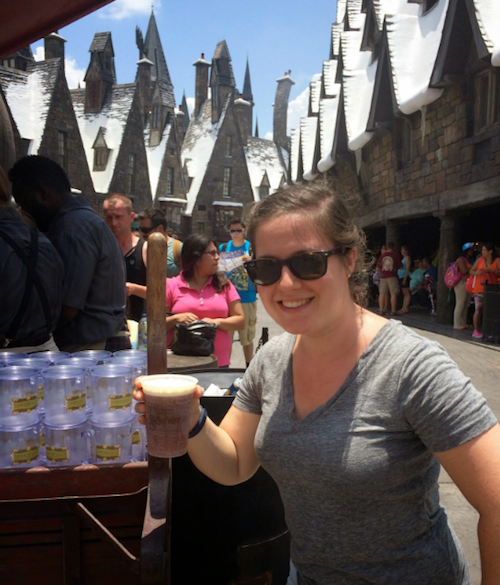 Some of my favorite posts so far have been: Harry Potter is My Homeboy , 5 Travel Tips for NYC, and Confessions: My Thighs Touch . I'm a huge huge huge fan of Harry Potter (much more so the books- not the movies) and Harry Potter is My Homeboy is my tribute to him, how I found the series, what it means to me and hoping that if you are not already hooked- you will be soon. My travel tips for NYC are helpful for any new or old visitor to this great city- plus it includes some apps that will aid you on your way! And my confession (because who doesn't love a good confession!) but one that is honest, and talks about the dreaded size issues.